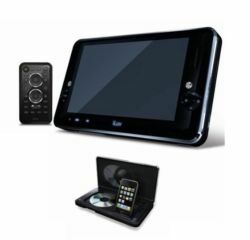 iLuv, the leader in innovative audio solutions has announced its latest i1166 Portable Multimedia Players for iPod and DVDs . The i1166 features with complete docking station for iPod that able to charges the device while providing full remote control. It also offers with video output for TV connectivity and compatible with DivX videos. However, it also offers display function with multiple subtitle, angle, audio options, a fast motion playback and zoom operation. The i1166 comes with built in SD/MMC card and USB support for transfer new music into the device, and built in digital photo frame that enable the viewing of photos from media such as built in memory, memory cards, USB, DVD±R/RW and CD-R/RW. The media players in the device are supports DVD±R/RW, CD, VCD, CD-R/RW, MP3, MP3 CD JPEG, Kodak, DivX, and MPEG-4. Additional, it support three types of power sources such as AC, DC car adapter and built in Li-Polymer rechargeable battery. It expected to be released sometimes in March and the price yet to know. The package also includes a remote control.